Rarely in history has a president of the French Republic been so hated as Emmanuel Macron is today. His televised speech on 10 December, as solemn as anyone might wish, and the crumbs he distributed with ‘compassion’ to the poorest on that occasion – without in any way reversing the highly unfair measures he encouraged or decided to take, first as advisor to Hollande, then as minister for the economy and finally as President – will not change this fact. The explanation for such a massive rejection is well known: the class contempt he has shown, both in his actions and in his words, has come back to haunt him, with all the strength of an angry population, and he is only getting what he greatly deserves. With the social upheaval of the gilets jaunes, the veil has been torn away, at least for a while. Macron’s ‘new world’ is the old one but worse: that is the main message delivered by the gilets jaunes since November. In 2017, Macron and his ‘En Marche’ project played on the deep hatred of the working and middle classes towards rulers who had never stopped worsening their situation at work and in their daily lives, to prevail against all expectations in the race for the presidency. In this conquest of key institutions, Macron did not hesitate to cynically use the populist register of making a clean slate, despite never being anything but the ‘candidate of the oligarchy’, and in particular of its elite body, the Inspection Générale des Finances. The manoeuvre was crude but it worked by default. Despite his ideas having only minority support, he won by a double vote of rejection – in the first round, of the authoritarian-neoliberal parties (the twins of the Socialist Party and the Republicans), and in the second round, of the candidate of the neo-fascist party. In the guise of renewal, voters have been treated since the spring of 2017 to an unprecedented aggravation and acceleration of everything they had previously rejected. They have been shattered by a flood of measures that successively weakened living standards and disempowered the working and middle classes, to the benefit of the most privileged and the big corporations. Recent polls on this point don’t deceive: the class divide appears in a clear light in people’s condemnations of Macron’s policies. 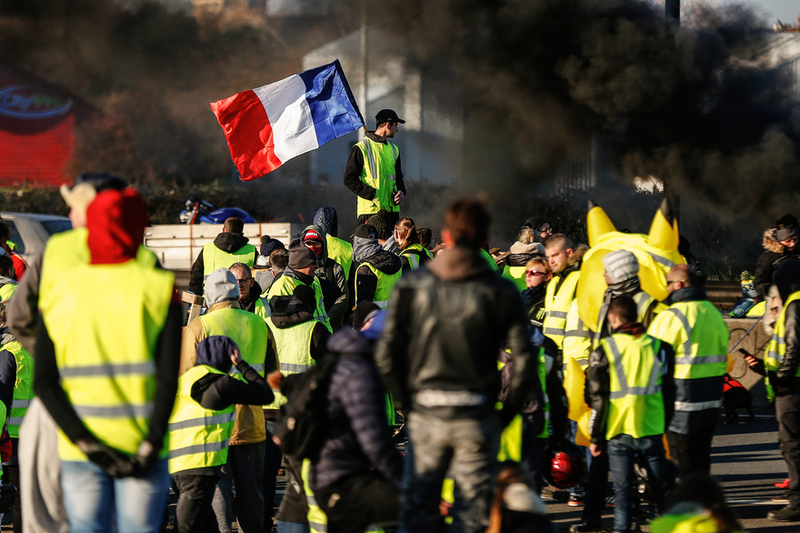 The fact that the gilets jaunes demand the restoration of the wealth tax, an increase in benefits and the minimum wage, and the restoration of pension indexing, demands going well beyond the abolition of the fuel tax increase and a moratorium on the price of electricity and gas, says a lot about the social significance of the movement. Only the government’s blatant propaganda about the ‘seditious’ and ‘factious’ leagues of the 1930s, complacently relayed by the subservient media, a few ‘media personalities’ and a few misguided trade-union leaders, could lead some people to believe that the movement was intrinsically fascist. It must be said and repeated here with force: if the far right has tried to recuperate this popular anger, and if it eventually succeeds, it will only be through the bankruptcy of the political left and the trade unions in their function of defending the interests of the greatest number of people. The gilets jaunes, like it or not, have achieved what thirty years of social struggles have failed to do: to put the issue of social justice at the centre of the debate. Better still, they have clearly imposed the question, fundamental for all humanity, of the link between social justice and ecological justice. This social revolt can only be understood in relation to the type of transformation that the current government has set out to pursue with fiscal and regulatory brutality. The Macron ‘revolution’ has never been anything but a radical and hasty implementation of a dominant conception of society based on competition, performance, profitability and the ‘trickle-down’ of wealth from the top. Extending a constant policy of tax exemption for capital and companies, it has continued and amplified the transfer of the tax and social burden to households, especially the most modest, by increasing the most unequal taxes on consumption in the name of ‘competitiveness’. In other words, it was by choosing the most purely neoliberal path that Macron sought to transform France, thus seeking, through this ‘revolution’ that served as his programme, to become the good pupil of business, the European commissioners and ‘international investors’. He wasn’t the first, he probably won’t be the last, but he wanted to excel in the genre, better than Sarkozy and Hollande combined. But it seems that he did not have broad enough shoulders or sufficient skill to transform the ‘reluctant Gauls’, the ‘illiterate’ and the ‘nothing people’ into followers of his ‘start-up nation’ and supporters of ever-lower labour costs. Managing the state and running the government in the way of the boss of a large multinational, according to the new standards for top civil servants converted to capitalist ideals, was not enough. The centralization and verticality of the Fifth Republic, the all-out police repression, the regimentation to the point the destruction of a parliamentary majority composed of bland neophytes and licensed opportunists, have so far been institutionally powerful but nevertheless insufficient means to make the population accept both the deterioration of their living conditions and their disempowerment, both in the workplace and at the municipal level. Real life prevailed over the illusions of an oligarchy blinded by its ‘truth’, who had believed its time had come with the miraculous election of a President childishly drunk on the political omnipotence bestowed on him by fundamentally anti-democratic institutions. The social uprising of the gilets jaunes, by suppressing Macron’s neoliberal machine, has shown the limits of what should be called his managerial Bonapartism. This authoritarian governmental practice has brought neoliberalism to a breaking point. The current rulers, supported by the employers, are trying a final manoeuvre, the nature of which can already be guessed, using the social and political crisis to strengthen the neoliberalization of society more subtly than the ‘blitzkrieg’ of Macron’s first season. We already know their main arguments. The first, with the totally unscrupulous support of all television and radio stations, is the usual call for order in the face of a violence one-sidedly attributed to the demonstrators, who were ‘of course’ complicit when young criminals looted shops at the end of a demonstration. To frighten and at the same time seek the help of all ‘responsible’ forces not only helps exonerate the government from its own responsibilities, it also masks all its violations of the most fundamental freedoms such as the right to demonstrate (2,000 arbitrary arrests), and justifies the violent methods used by the police against demonstrators (in particular the dangerous use of sound bombs and so-called ‘anti-encirclement’ or sting-ball grenades). From this point of view, the collective humiliation imposed on secondary school students in Mantes-la-Jolie recalls the worst methods of colonialism, in continuity with the ‘treatment’ of the 2005 riots, and makes Ségolène Royal’s remarks particularly revolting. The government’s second line of defence is to select from the demonstrators’ disparate demands those that go in the direction of reducing public spending. This is the tactic already chosen by Geoffroy Roux de Bézieux, spokesman for the MEDEF employers’ association, who has no hesitation in praising the effectiveness of Trump’s tax reduction. Presenting this great social mobilization as a neo-Poujadist movement of small businesses crushed by taxes and social charges, ‘sick and tired’ of these burdens rather than by social injustice, has the advantage of making people believe that the only way to increase purchasing power is to reduce the socialized share of income and curtail public services along with a tax cut (since there is no question in the current context of lowering military and police spending). Unless Macron chooses, following the lead of Sarkozy, to encourage tax-free overtime – another MEDEF dream. This clearly avoids infringing on the privileges of the richest, the freedom of wealth to evade tax, the scandals of the CICE and the CIR, mechanisms that, without any counterpart, control or constraint, consist in transferring tens of billions to companies, most of which do not need it. This manoeuvre will require the designation of scapegoats, of course. Why not target, not the ‘rich’ – as most of the gilets jaunes would prefer – but the humbler civil servants, too numerous, too well paid, not productive enough? Why not ask them for some additional sacrifices in the name of solidarity with the poorest? We know that there are some trade-union officials who have their pens ready to ratify the most flagrant social cuts. Unless, and this is not the least scandalous part of the presidential address, the aim is to focus the debate on the ‘immigration issue’, or even Islam, despite this being in no way central in the statements of the gilets jaunes. However, nothing was settled by Macron’s television intervention on 10 December. There is no guarantee that the anger will subside quickly. This would be very surprising, given how much the authorities have been shaken. Soon French society, like others throughout the world, will have to choose between two diverging paths. The first is the nationalist, protectionist, hyper-authoritarian, anti-ecological path, that of Trump, Bannon, Salvini, Le Pen, Bolsonaro, Orban or Erdogan, which thrives all over the world by exploiting all the frustrations and resentments generated by neoliberalism. Yet far from being an alternative to neoliberalism, this path is a new and radically anti-democratic historical version of it, at a time when social, political and environmental consequences raise the question of a fundamental change in the economic and political system. The object is to make people believe that the restoration of a nation-state governed with an iron hand, endowed with all the attributes of internal and external sovereignty, capable of closing its borders to migrants, imposing the toughest financial and market laws on the population and rejecting all international cooperation agreements on climate, is the only way to improve the social situation of the vast majority. Trump is now the world-class champion of this line and is greatly assisted in this role by Macron. The second path, democratic, ecological and egalitarian, which has been asserted for several decades in all social struggles and resistance to neoliberalism, in alterglobalism, in the movements of squares, in the multiple laboratories of the commons, is the only one capable of avoiding the collapse of ecosystems and the disintegration and fragmentation of societies. Its only shortcoming is that it does not yet have majority expression and a new political form. It has suffered first of all from the betrayal of the governmental left, particularly the ‘social-democratic’ left, and is now tragically weakened by divisions between leaders of organizations more concerned with own their parochial interests than with their historical responsibility. The most acute question today is therefore whether or not the gilets jaunes uprising will enable the democratic, ecological and egalitarian line to prevail over the nationalist, fascistic identity line that has won in Italy and now in Brazil. As has often been observed, this movement has brought together individuals of different classes, different ages, different opinions. Some abuses of a racist, misogynistic or frankly fascist type have occurred, and may still occur here and there, even develop. Looting and attacks on shops by youth gangs have also taken place in some parts of the capital and in several city centres, and this has served as an alibi to discredit the social movement. However, this is not the deep logic of the movement, which is diverse, plural and often driven at the grassroots by women. If a lone individual has called on a general to take power, he is in no way the legitimate representative of a movement that rejects any usurpation by representation. The current and underlying logic of the movement is not to rely on a leader embodying the people, however this is viewed by the theorists of populism, for whom it is the representative who makes the people and gives them their unity. Nor is it to renew ‘national representation’ with a dissolution of parliament, even if the leaders of both La France Insoumise and the Rassemblement National (former Front National) seek to channel the movement onto the electoral terrain. Everyone knows, or should know, that in this game it is the neo-fascist party that would win the day. Without prejudging the outcome of the gilets jaunes, the first lesson we can draw from the movement is the innovative capacity it has shown, rejecting in advance any recuperation and relying only on its collective strength to make itself heard and formulate its demands without tactical calculation by a party apparatus, starting from the intolerable conditions experienced by real and previously invisible individuals. What has been presented on television as the movement’s main weakness, its ‘inability’ to be represented, is nevertheless its most remarkable characteristic, and the full meaning of this should be understood: it is not a ‘inability’, it is a rejection in principle of any representation. And this rejection is fully justified. There can be hardly any doubt that this is a consequence of a deep crisis of legitimacy of governments, elected officials, the media and even trade unions, a crisis caused and accentuated by the neoliberal radicalization of oligarchies. But there is another aspect, which is scarcely noted in comments but is nevertheless the positive counterpart of this refusal to accept any representation. It is that, faced with the hollowing out of a representative democracy that no longer represents society, the most spontaneous response of the gilets jaunes has been the self-organization of actions, not just roadblocks and demonstrations but also the collective elaboration of demands in the course of meetings and assemblies. A wonderful lesson for parties and trade unions whose traditional reflex is to supervise the masses and issue demands, instructions and slogans from the top down. Here in Commercy, in the Meuse, we have operated from the beginning with daily popular assemblies, where each person participates on an equal basis. We have organized blockades of the town and of filling stations, and selective road blocks. At the same time, we built a cabin in the central square. We meet there every day to organize ourselves, decide on the next actions, dialogue with people, and welcome those who join the movement. We also organize ‘solidarity meals’, to experience great moments together and get to know each other. In full equality. But now the government, and some fringes of the movement, are proposing that we appoint representatives by region! In other words, a few people who would become the sole ‘interlocutors’ of the public authorities and sum up our diversity. But we don’t want ‘representatives’ who would necessarily end up talking for us! (...) It is not to help understand our anger and demands that the government wants ‘representatives’: it is to supervise and bury us! Together with union leaders, it is looking for intermediaries, people that it could negotiate with. That it could put pressure on to calm the eruption. People it could then recuperate and propel to divide the movement and bury it. But that fails to take into account the strength and intelligence of our movement. Not to mention that we are constantly thinking, organizing ourselves, developing our actions that scare them so much and amplifying the movement! And above all, there is one very important thing that the gilets jaunes movement everywhere demands in various forms, far beyond purchasing power! That is power to the people, by the people, for the people. It is a new system where ‘those who are nothing’, as they say with contempt, take back power over all those who gorge themselves, over the leaders and over the powers of money. It’s equality. It’s justice. It’s freedom. That’s what we want! And it starts from the base! If we appoint ‘representatives’ and ‘spokespersons’, it will end up making us passive. Worse still: we will have rapidly reproduced the system, and be functioning from the top down like the scoundrels who lead us. Those so-called ‘representatives of the people’, who line their pockets, make laws that ruin our lives and serve the interests of the ultra-rich! Let’s not get caught up in the spiral of representation and recuperation. This is not the time to entrust our words to a small handful, even if they seem honest. Let them all listen to us or not listen to anyone! From Commercy, we therefore call for the creation of popular committees throughout France, to operate as regular general assemblies. Places where speech is free, where people dare to express themselves, practise and help each other. If there are to be delegates, it must be at the level of each local popular committee of gilets jaunes, as close as possible to the voice of the people. With mandatory, revocable and rotating mandates. With transparency. With confidence. Anyone who has seen the authors of this appeal take turns in front of the microphone in order to avoid any capture of their speech by a ‘representative’ will immediately understand the depth of the democratic demand that drives this movement. Once again, this is much more than mistrust, it is a rejection of substitution, whereby a minority assumes the right to speak and act in the place of the greatest number. The great prescience of this declaration is to be welcomed: since 6 December, trade-union ‘representatives’, with the notable exception of Solidaires, have been quick to come to the aid of a totally isolated and tottering Macron, which has even provoked a reaction within the CGT itself. These famous ‘intermediate bodies’ are fully part of the logic of representation, and far from embodying a positive outcome to the crisis of the regime, they can only help Macron to regain control. Of course, there is no guarantee that the possibilities opened by this democracy in action will be realized. The only thing that matters right now is that it is worth fighting for its achievement. We can leave contempt for democratic invention to the neo-Blanquists of the ‘coming insurrection’ and the other celebrants of ‘pure violence’. The casseurs who graft themselves onto demonstrations, and do not participate in any way in collective decisions, also contribute to depriving the movement of its internal democracy. The whole question is whether the thoroughly democratic spirit of the movement will be deep enough to take permanent root and immunize society from the fascistic temptations that could develop if it fails and decays. And this single question clearly involves our responsibility, the responsibility of us all. A strange reasoning reveals the deep embarrassment of a part of the so-called ‘radical’ left in the face of this singular and unprecedented movement that thwarts all categories of its conventional political lexicon. These people argue that such a movement ‘risks’ drifting in a bad, reactionary or fascistic direction if it fails to offer all the guarantees required to reassure us about its political future. This assessment of risk is expressed in a cautious attitude, if not outright refusal to get involved with those who do not meet the criteria by which they recognize that they are dealing with the ‘people’, the true people, those that bear the authentic values of the left, identify with its objectives and struggles and certainly run no risk of being dragged down the slope of fascism. This reasoning calls for two remarks. The first concerns the use of the word ‘people’. Clearly, it is invested here with a completely ideal meaning: it is ‘the people’ in the singular, with whom the real people, necessarily impure and variegated, pale in comparison, summoned to conform to this ideal in order to deserve this prestigious designation. If they fail to do so, it is justifiable to move away from them and leave them to themselves. Unfortunately, this ideal people does not exist, except in the almost Platonic heaven of incorruptible leftism. No more than does ‘the people’ seen as a ‘community of citizens’, so dear to the republican tradition and ritually resurrected in each major election at the same time as the mystification of the ‘general interest’, which is simply a people made to measure by existing political institutions for the greater benefit of the oligarchy. We should be quite clear: the real people are never the ideal people. Let us leave the dream of an ideal people to the bureaucrats and other patented avant-gardists. In the aftermath of the popular uprising of 17 June 1953 in East Berlin, Brecht asked: ‘Wouldn’t it be easier then for the government to dissolve the people and elect another?’ Unless we resort to such ridiculous ‘change the people’ demands, which undoubtedly offer protection against disappointment, we must accept the heterogeneity and impurity of the real people. Everything else is a diversion. Does this mean no distinction can be made between the ‘social people’ and the ‘political people’? The social people are defined by poverty and misery, as opposed to the elites or the oligarchy, but they are equally heterogeneous and varied, traversed by tensions and contradictions, as we see today. The true political people are neither the people of the electorate, nor the people sociologically defined by poverty or misery, they are the people who act, the people-actor inventing new forms of self-organization in action. This people is never ‘all’, it is always only a part, but it is the part that opens new possibilities for all, that is, for the whole society. It is this part that is now in motion, and that is enough for its self-determination. The ‘people of the left’ is nothing more than a false invention of old parties whose only function is to reactivate their electoral base as certain consultations approach or when they find themselves in difficulty. More generally, there are only ‘peoples’ in the plural, their emergence unpredictable and each time singular, and the ‘one equals all’ formula is just a fatal illusion. The coincidence of the social and political people in a fantasized ‘new dawn’ is just a myth that the critical left must cast off once and for all. The second remark relates to the practical conclusion that this argument is intended to justify. Surprising as it may seem, such reasoning is somewhat similar to a very old argument, known in Greek philosophy as ‘lazy’ or ‘inert’. Cicero sets it out in his treatise Concerning Fate, arguing that if we accept it, we would spend our entire lives in complete inaction. It basically runs: ‘If you are sick and your destiny is to heal, you will heal, whether you call the doctor or not; but if your destiny is not to heal, then whether you call the doctor or not, you will not heal. But your destiny is either to heal or not to heal. It is therefore futile for you to call the doctor.’ We can see how this argument well deserves the name ‘lazy’: it justifies abstention from any action and inclines people to quietism (from quies which means rest in Latin). Some people will argue against such a comparison by saying that those who warn against the danger of a rightward drift of the movement are not invoking fate or fatalism but simply acknowledging risks, mere possibilities. But the question is precisely what attitude to adopt with regard to what are currently only ‘possibilities’. The object of the comparison proposed here is to highlight the quietist attitude that results from this acknowledgment of remote possibilities. These people argue as if the realization of one possibility rather than another was completely independent of their own action. They say to themselves, without really daring to admit it: if the worst possibility comes true, it will come true, whether or not we intervene to try to prevent it. This is where the ‘lazy reason’ lies. In this way, they release themselves in advance from any responsibility. The premise behind this attitude is that no matter what possibility may eventually come about, even the worst, we have nothing to do with it. Either this possibility will happen or it will not, but in either case it is futile to intervene. If by chance it does happen, responsibility for it is attributed in advance to the inadequacies and ambiguities of the movement. However, to refrain from practical intervention does not simply mean observing the course of evolution from the outside; it means, whether this is denied or not, promoting the realization of the most worrying and threatening possibility, the one that was precisely responsible for justifying the refusal to act. It is all the easier to say ‘we told you so’ afterwards if you have yourself directly contributed to making this negative possibility a reality. Today, in particular, it is important to warn against such an attitude: political quietism plays into the opponent’s hands, and is therefore unforgivable. Urgency demands that we act in the movement as it is and with the gilets jaunes, taking them as they are and not as we would like them to be; resolutely supporting everything that goes in the direction of self-organization and democracy. Let’s repeat, it’s not over yet. The present is new, the future is open and our action matters, here and now. Act V.